Chicago Brauhaus co-owner Harry Kempf has the honor of tapping the keg Friday to kick off Lincoln Square’s Maifest, a traditional German festival celebrating the arrival of spring. Festival organizer Joe Matuschka of the May Fest Committee said the group wanted to recognize Kempf as he turns 80 – and with the future of his iconic restaurant in doubt. Kempf and his brother, Guenter, are in the process of selling the building at 4732 N. Lincoln Ave., though Harry Kempf denied rumors earlier this year that the 52-year-old restaurant was closing. Maifest 2017 takes place just steps from the Brauhaus at the intersection of Lincoln and Leland avenues, where Kempf will usher in a weekend of beer, bratwurst and polka music by leading a traditional keg-tapping ceremony at 8 p.m. Friday (The festival actually opens at 5 p.m. Thursday). Friday’s ceremony also includes the crowning of the May Queen. Matuschka said the four-day festival typically attracts 20,000-25,000 visitors, a total he calculates using a fitting metric. “We figure out by the number of bratwurst we are selling,” said Matuschka, who is from Mainz, a city near Frankfurt along the Rhine River. Matuschka came to the U.S. in 1965 and has run Chicago’s Maifest for the past 16 years. Maifest is still celebrated throughout Germany, with villages decorating a blue and white-striped Maibaum (maypole) to show off the history and crafts of their town. Chicago’s version of the festival features a full lineup of live music acts playing in one of two tents. On Sunday, a German-American ethnic program will present a maypole dance, folk dancing and other traditions. Matuschka said 2.5 tons of bratwurst are consumed each Maifest, along with thousands of liters of beer. Sales from the festival benefit several German organizations, including DANK Haus, American Aid Society of German Descendants and the Donauschwaben Youth Group. Beer options include a lager imported from Munich’s Hofbräuhaus and, for those seeking a lighter option, Pabst Blue Ribbon. In addition to bratwurst, visitors can purchase Leberkäse, a German take on meatloaf served with sweet mustard; fish sandwiches (often made with herring); sauerkraut; potato salad; and coffee and cake. As for special guests, Matuschka said the Jesse White Tumblers will perform at 1 p.m. Sunday. Matuschka said he also expects politicians to make an appearance with campaign season kicking into gear. Lincoln Square's Maifest features a lineup of live music Thursday through Sunday. Matuschka, owner of Rosemont’s Hofbräuhaus restaurant and beer hall, said he invited German soccer star Bastian Schweinsteiger to the festival after meeting the Chicago Fire newcomer in Rosemont. But the Fire leave town Friday for a weekend match in Orlando, so Matuschka said it’s doubtful that Schweinsteiger will make it. Entrance to the festival is free. Parking is available at St. Mathias Church and MB Financial Bank. 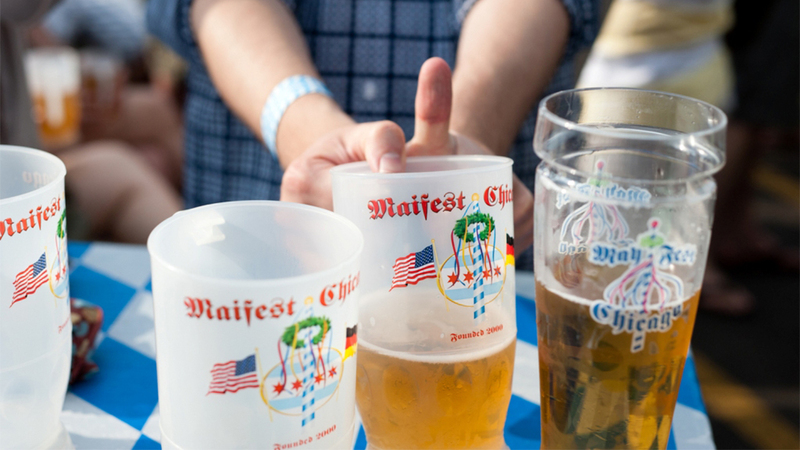 Click here for more information about Maifest, including a full music schedule. June 1: Art fairs, comedy shows and street festivals usher in the weekend. Here are 10 things to do in and around Chicago. May 10: Brew news with Lagunitas Brewing Company founder Tony Magee. May 12, 2016: If you're in search of great beer in Chicago, a new interactive website can help. The founders of Chicagos.Beer join "Chicago Tonight" to explain.